Our company is the big Manufacturer which specializes in all kinds of acrylic products. We are not dealers, distributors or retailers. We can offer you Wholesale price but premium quality with professional packaging. Notice: The actual product is transparent and does not contain color pages. HIGH DEFINITION. It has independent and innovative design.Thanks to the clear acrylic material, advertising pictures can be seen clearly and efficiently. SOLID ACRYLIC MATERIAL.Made of top-quality acrylic, this clear sign holder features excellent durability and resiliency. Acrylic is a shatter-resistant material that boasts great strength despite its light weight.It is also a highly scratch resistant material. 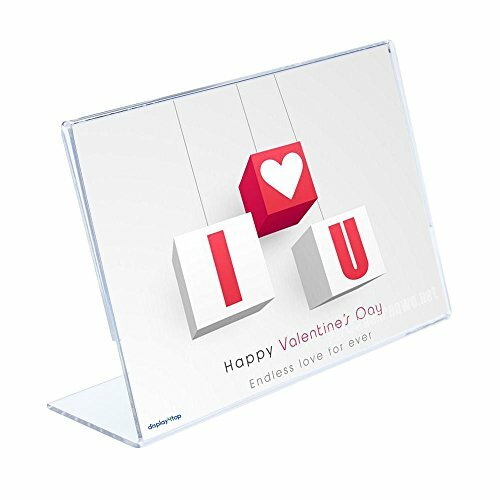 ALL- PURPOSE.This sign holder is versatile, serves a lot of purposes.Slanted sign holder stands by itself on any table or desktop.You can also use this clear acrylic as a frame to display awards and certificates at home or in the office. In hotel reception areas, it can be used to promote package deals and new features. In schools, it can display regulations and academic news. NO ASSEMBLY REQUIRED.The sign holder is self-standing and doesn't require assembly.Each sign holder has an opening on its side for easy paper insertion.Insert an 11" wide by 8.5 " high sheet of paper through the sides. If you have any questions about this product by Pro Display, contact us by completing and submitting the form below. If you are looking for a specif part number, please include it with your message.